Stone’s book is a bit like that revelatory moment when you hear a new kind of sound and it seems to ignite the air around you. The steel guitar probably evokes for most readers the sound of American country music, either for good or for ill. In fact, the sound of its twangy yearning has a complex history, appearing first as a standard part of the Hawaiian musical sound beginning in the late 19th century. In the '20s and '30s, the enormous popularity of Hawaiian music in the United States made it highly influential for bluegrass and emerging “hillbilly” or country styles. More recently, the pedal steel guitar has gone way uptown, featured in a major symphonic composition entitled Concerto for Steel Pedal Guitar and Orchestra by Los Angeles Composer Michael A. Levine. 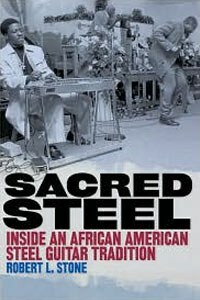 Robert L. Stone’s Sacred Steel: Inside an African American Steel Guitar Tradition shows that for much of the 20th century, the steel guitar has also been the most significant instrument in the ecstatic worship styles of “The House of God” and “The Church of the Living God”, two tiny, Pentecostal, ancestrally and doctrinally related African American denominations. In the high energy worship services of these churches, this instrument became a kind of second voice to that of the preacher. In the eyes of the faithful, this has elevated the best steel guitarists into the realm of the sacred, artisans of God who pass their craft from one generation to the next. Stone carefully explores the history of this tradition, telling first the story of brothers Troman and Willie Claude Eason who, in rural Georgia of the mid-'30s, heard the sounds of Hawaiian guitar over the radio and arranged to have lessons. Willie Eason would become the first to make the steel guitar central to worship, his personal dynamism and the power of his singing voice making him into a kind of holy bard in the high-energy worship services. Much of the book involves Stone tracing the personal history of subsequent generations of performers, biographical portraits that also intersect with changes and adaptation in the music and in the history of African American life in the 20th century. Stone’s own feeling for this music clearly comes through. The author is himself a musician and a producer of a number of steel guitar albums. His background as a folklorist comes through very clearly however, and he never falls into the temptation to personalize the material too much. It's Stone’s ability to write sparsely, objectively and thoughtfully about the religious tradition of the musicians he studies that is one of the more significant achievements of this book. The author clearly understands that, for the steel guitarists themselves, their religious beliefs are a key element in how they see themselves and their music. In early chapters, Stone carefully explains to the outsider the theological belief of these churches and the aesthetic of their worship. In this way, Stone fully materializes the context of these musicians and their styles. This approach allows the author to examine the role played by religious faith in the creation of musical styles. At the same time, Stone does an excellent job of showing how younger practitioners are open to influences from the larger world of blues guitar and to experimentation with various styles. The fiery blues guitar style of Stevie Ray Vaughn is an important influence for this new generation of steel guitarists, as is the traditional Nashville sound. Some have successfully stepped outside of the bounds of the church and performed in concerts with gospel/R&B greats like Al Greene, Shirley Caesar and Mavis Staples. Many readers will find that the significant biographical detail on some individual musicians, while undeniably complete and detailed, may be more than they need to know. Still, it is in keeping with Stones’ purpose of making sure the history of this African American musical tradition is preserved. Moreover, his ability to take a voluminous number of interviews and shape them into a coherent narrative of this tradition is a wonder to behold. I would have liked to see more discussion in Sacred Steel of the gender dynamics at work in the apprenticeship system, and performance tradition, of the steel guitar in worship. It's immediately striking that the most well known steel guitarists are male. The theory and practice of this worship style has frequently been passed from father to son. This is especially notable in that these Pentecostal traditions are open to female clergy and it would not have taken the author too far beyond his purpose to explore this issue. There is a moment in the book when Stone describes a performance given by steel guitarist Aubrey Ghent at the Florida Folk Festival in 1994. This was the first time that a “House of God” steel guitarist had appeared before an audience outside of the church in recent times and the very first time one had appeared at a folk festival. The audience response to what Stone describes as “searing” licks was instant and wild. The slow blues shuffle of the gospel song “Don’t Let the Devil Ride” had been given a bit of twang and a new group of fans was born. Stone’s book is a bit like that revelatory moment when you hear a new kind of sound and it seems to ignite the air around you. He has done something special, not only for the artists whose lives and history he has chronicled, but for those of us previously unaware of this important tradition of African American music.